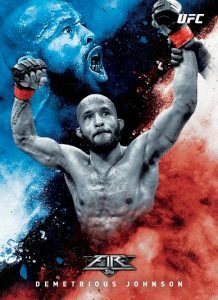 Bringing the Topps Fire brand to Ultimate Fighting Championship, the 2017 Topps UFC Fire checklist features the distinct designs of Tyson Beck combined with the biggest stars of the sport. Sold directly through Topps' online store, each box guarantees one signed card. Largely mirroring the format of the High Impact set from last year, 2017 Topps UFC Fire keeps things relatively simple with just a base set, one autograph option and a single insert line. The 50-card base set features top UFC fighters with three different designs. Collectors can also find Foilboard parallels in Red Hot (#/142), Blue Flame (#/25) and Inferno (1/1) editions. These parallels average two per box. On to the hits, the main Autograph insert in 2017 Topps UFC Fire offers 39 fighters at a rate of one per box. 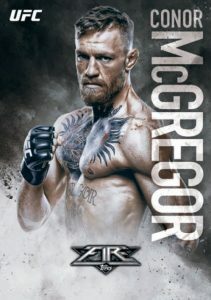 The lineup features Connor McGregor, Ronda Rousey and many others. Low-numbered parallels include Blue Flame (#/25) and Inferno (1/1). Finally, also falling one per box, 2017 Topps UFC Fire adds the emotion-filled Fired Up insert. 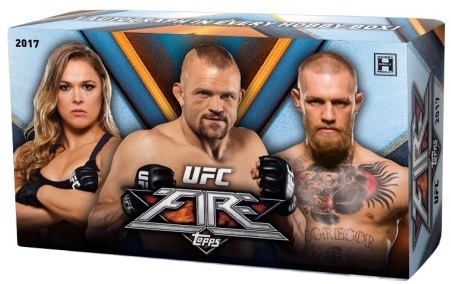 2017 Topps UFC Fire boxes cost $24.99 on the Topps website. 50 cards. Shop boxes on the Topps website. FOILBOARD PARALLEL CARDS: Red Hot #/142, Blue Flame #/25, Inferno 1/1. 39 cards. 1 per box. Shop boxes on the Topps website. FOILBOARD PARALLEL CARDS: Blue Flame #/25, Inferno 1/1. 2016 TOPPS UFC MUSEUM COLLECTION SEALED HOBBY BOX!